Don’t worry, this isn’t a pop quiz on pandas. I just wanted to share a small thought I had in Memphis, Tennessee when we were visiting my mother. One day we went to the zoo there—one of the better zoos in the United States—and had the chance to see a big panda munching bamboo. This is actually more memorable than it sounds because the half-dozen other times I’ve seen a panda, they were always sound asleep. First, let me be clear: I don’t recommend that you take after a panda when it comes to its sleeping habits. A grown panda is a pretty sluggish creature that naps a lot and poops frequently while at rest. Not only would this limit the language exposure you’re able to provide your children, you probably wouldn’t be setting the best sort of example for toilet-training, either. No, the one way parents should be like a panda bear involves eating bamboo. Relax, you don’t actually have to eat any. (I’d have even fewer teeth than I do now! ) But I would like you to take a peek at this short video clip. This isn’t the panda I saw in Memphis, mind you, but it will give you a good sense of what I saw that day at the zoo. 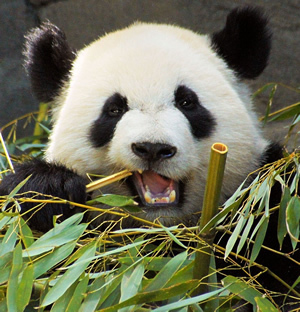 What did you notice about the way pandas eat bamboo? And remember, they eat like this all day long, and they spend very little time doing anything else (besides napping and pooping). This might not be the best way to describe a panda’s behavior, since instinct is their driving force, but when I saw that panda completely fixed on his food—crunching and tearing and chomping, over and over again—it seemed the perfect symbol of a mindset needed by us all to advance steadily on this bilingual journey. Like a bamboo-eating panda, we must be single-minded each day. But what do I mean, exactly, by “single-minded”? First of all, I’m not suggesting that you ponder your bilingual quest consciously throughout the day, like a song that keeps looping endlessly in your head. You’ll soon feel stressed out and weary of the whole business. Careful thinking is clearly vital to our success at raising a bilingual child, but “too much thinking” can undermine our performance and peace of mind. The better way to be “single-minded” is to fix your bilingual goal firmly in mind, then let it pulse there continuously, day after day, like a heartbeat. At times, of course, you’ll be looking at things consciously: researching strategies, executing ideas, investigating resources. At other times, though, the process should be more subconscious: you quietly monitor your child’s progress and the evolution of your circumstances. Then, based on these ongoing observations, you consciously consider your response to the new areas of need. In other words, being “single-minded” as a parent means engaging in a delicate dance between conscious effort and subconscious attention, a continuous dance that stretches from the child’s birth to the day you collapse in a hammock after she leaves home. The thing is, if you’re not “single-minded” to a significant degree—if the bilingual goal doesn’t pulse there pretty continuously in your mind—it can be awfully easy to lose hold of amid the busyness of life. And before you know it, days, weeks, even months have passed without much attention to this aim and the lack of effort can spell a growing imbalance between the child’s two languages. For some, this may not be an immediate concern, but in my case—and for those who wish to maintain a good balance between the two languages throughout childhood—each day counts, for both the nearer present and the farther future. Enjoy your bamboo, fellow panda. For more encouragement to “seize each day,” see Thoughts on Death and Life and the Bilingual Child. How about you? Are you sufficiently “single-minded” in your quest to raise bilingual kids?